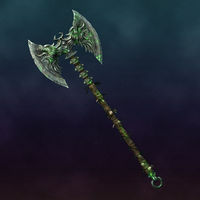 The Rueful Axe is a Daedric artifact created by the Daedric Prince Clavicus Vile. It takes the form of a large iron battleaxe engraved with images of werewolves, although it is actually made of ebony. The axe is very heavy, and has a wicked blade that looks sharp enough to cut through a god. It is enchanted to magically fatigue anyone that it strikes. The axe was created by Vile for Sebastian Lort, a powerful Breton conjurer. Sebastian's daughter was a worshipper of Hircine, and was cursed with lycanthropy. Sebastian prayed to Vile to cure his daughter, and, in response, the Prince gave him the axe, giving the mage a means of "curing" his daughter by slaying her (which was no cure at all as Hircine still claims the souls of lycanthropes). In 4E 201, Vile tasked the Last Dragonborn with retrieving the axe from Sebastian, who was residing in a cave named Rimerock Burrow in Haafingar, Skyrim. In return, the Dragonborn requested that Vile would forgive Barbas, whom he had banished to Tamriel. Vile gave the Dragonborn the option of keeping the Rueful Axe and using it to slay Barbas and temporarily vanquish him to the Void, or going through with the original deal, in which Vile would take the axe and Barbas in return for the Masque of Clavicus Vile. It is unknown which option the Last Dragonborn chose. This page was last modified on 14 December 2018, at 20:51.